UPDATE: On October 8th, we were able to move into a site where we could obtain TV channels, and everyone now and then, Jim could pick up some WiFi. We still had to rely on our hotspot. By November 15th, the WiFi problems were corrected, and since that time we have had decent WiFi access almost all of the time. The same day, however, we lost our TV channels. 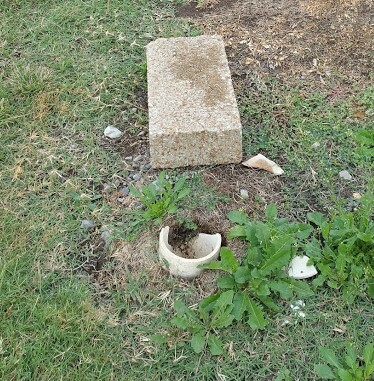 The owner was in process of switching from regular cable service to satellite service. The manager had been told the cable service would end on November 29th, but the RV park was cut off two weeks earlier, on the 15th. We did not have any TV service until after returning from Tennessee after Thanksgiving. While not as good of TV channel options as before, at least we have both TV and WiFi for the remainder of our stay here. Saturday night, the 1st, Jim and I were exhausted by the time we arrived at Speedway RV Park and were set up. Having skipped lunch, we were hungry, too, so it was convenient to have a restaurant next door. Lucky for us, it was one of the three nights it is open (Thursday – Saturday nights). Though early for supper, they were relatively busy, so we hoped that was a good sign. Seated, we studied the menu while our server got our drinks. Prices at the Cajun Shack were moderate, but I was disheartened to see that the vast majority of items on the menu were fried. Jim and I both found the food to be just “okay,” so I don’t expect we will return. It worked for what we needed that night. Over the past few days, I’ve learned that the RV park, the restaurant, and the flea market, on the other side of the restaurant, are owned by the same people. Bob and Teina, who are both extremely nice, manage the RV park; they are not the owners. 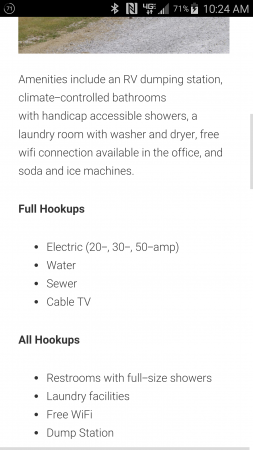 According to the park’s website and to Teina with whom I spoke about reservations, full hook-ups (FH) include cable TV and WiFi. After arriving, we were sent to site 30 in a FH (industry definition is water, sewer, and electric connections) section, which is almost as far away from the office as sites go. We looked at our site and knew it would not work. The sewer hook-up was broken, so they moved us one site over and closer to the front. It’s still broken, but Bob has been busy as Teina’s been in the hospital. Here’s what else we’ve learned so far. Only the 22 sites closest to the office have cable TV and are close enough to the WiFi to use it; we have neither. When we expressed our concern, we were told that we’ll be moved to the front as soon as something opens. We could live with that; surely it would not be long. Monday, I was out walking trying to locate the onsite laundry. I noticed that two sites up front,14 and 21, were empty. I asked Bob if some folks had moved out Sunday, and he said no. The two sites had been reserved (I assume before we made ours, so I can live with that), but one was due Saturday and has not made it yet. The other was due that day (Monday). Both sites are still empty. I’m beginning to have a problem with the fact that we need and requested WiFi and TV and don’t have it. 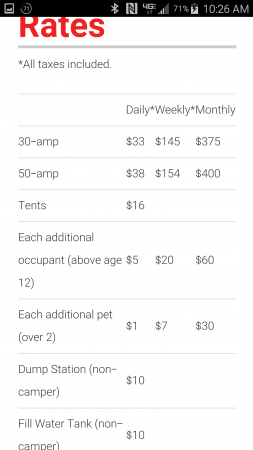 We are paying the same rate as the ones who do have these services. I’m hopeful that very soon we will be able to move to the front section, especially if these two sites continue to remain open. If not, it is going to be a long couple of months! Click on a picture below or hold cursor over it for caption. Finally, the owner is not putting money into up-keep. This is evident by issues that are readily seen. However, you can tell that Bob and Teina try to keep the place as clean and nice as they can; this is apparent in the office, bathrooms, and laundry. The pictures above are worth more than words. The web site does a good selling job, but reality is not the same as it is portrayed. Batesville on the other hand is much better than I expected. 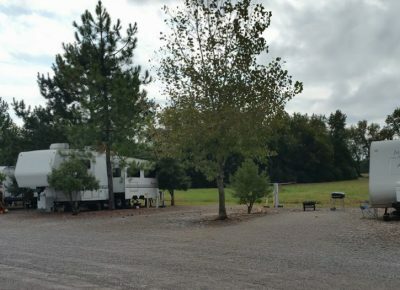 The RV Park is up on a big hill or small mountain, however you want to see it, so as you descend down to the White River Valley and into the town of Batesville, it is quite beautiful. The town has everything we’d need, and the historic downtown area is quite a fun place to visit. Sunday, as we explored our new home town, we found ourselves hungry about the time we near the historic downtown area. We found Elizabeth’s Restaurant and Catering. When we walked through the doors, my breath was taken. I felt like I was in a fancy city restaurant, or at the very least, a fancy wedding reception. We learned Sunday’s menu is an all you can eat buffet. There is a salad buffet, a meat buffet, a cooked vegetable buffet, and a dessert buffet. Homemade yeast rolls and choice of drink is included. 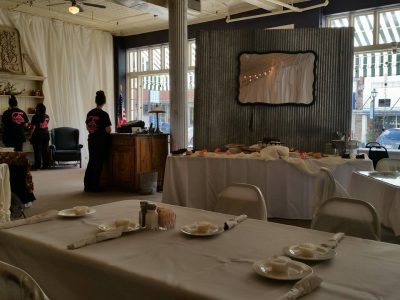 The service was great, especially for a buffet, and the price was unreal. Jim and I ate for less than $35, and that included a nice tip! 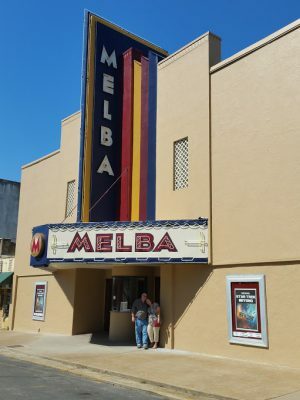 We wandered around the downtown area and discovered another gem: The Melba Theater. As we were making pictures, one of the owners happened upon us on her way to get ready to open for the Sunday matinee. I’m not going to talk about this too much here because Jim wants to do a whole post on it. We plan to attend the theater this Thursday night. 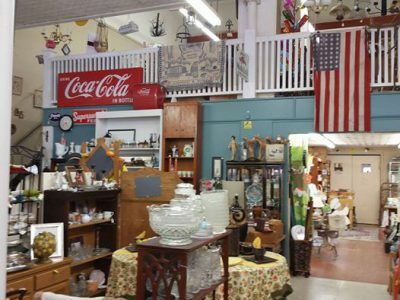 Not being a shopper, it was surprising that I was drawn into an antique store, Etta’s Attic, and I fell in love with the place. It is probably a good thing that we no longer have a house because I would have been tempted to purchase much more than I did. As it is, I left with two of the old divided school trays. I’d been looking for something like this. 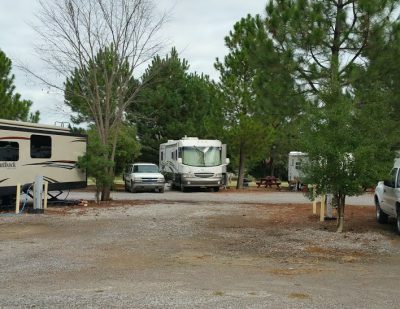 RVers who have lucked into such things find them useful for RV park socials; participants are asked to bring their own eating utensils and a drink. You can get more on the tray than a small paper plate. My only criticism of the area so far is that the drivers are reckless here. Jim says it may be because there is a NASCAR spirit in the area. It is the home of Mark Martin, and he has his NASCAR museum inside his Ford Dealership here. 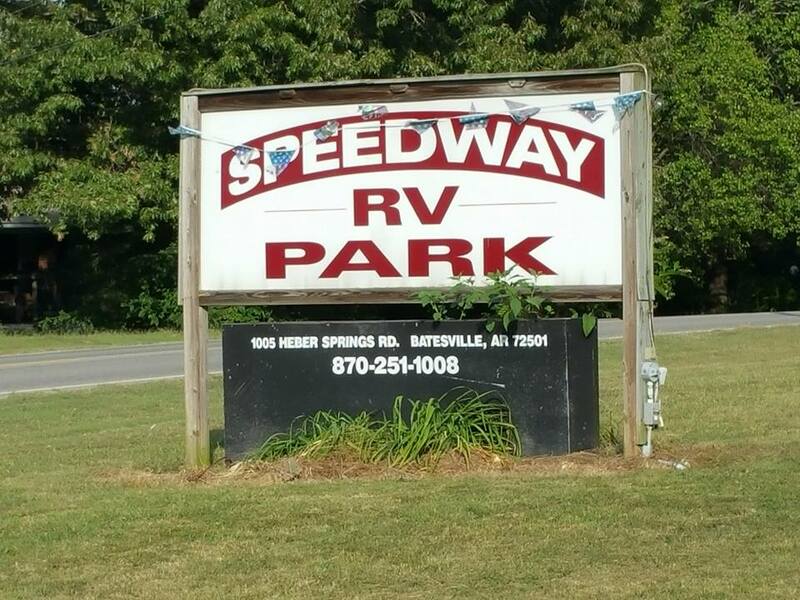 There is a reason the RV Park we are in is named Speedway; it is just down from the race track. Here’s a few photos going down and into Batesville and some more of the downtown area. I’m am really excited to get out and explore this weekend. We have plans to visit Blanchard Springs Caverns and several other spots I hope it will prove to be as beautiful as I expect. We’ll update you on these things later.